Your windows make your home more comfortable and beautiful by allowing you to enjoy the great outdoors without stepping outside. They also make your living spaces brighter and more comfortable by bringing in natural light. However, windows can represent significant vulnerabilities in your home, especially if they’re getting on in years. Window technology has come a long way and continues to improve, so if you don’t know how old your windows are or when they were last inspected or repaired, they may be costing a lot of money in energy bills. As cooler weather approaches, the efficiency of your windows becomes more and more important. Just as the windows can leak a bunch of cool air in the summer, they can leak a lot of warm air in the winter and drive your energy bill up. 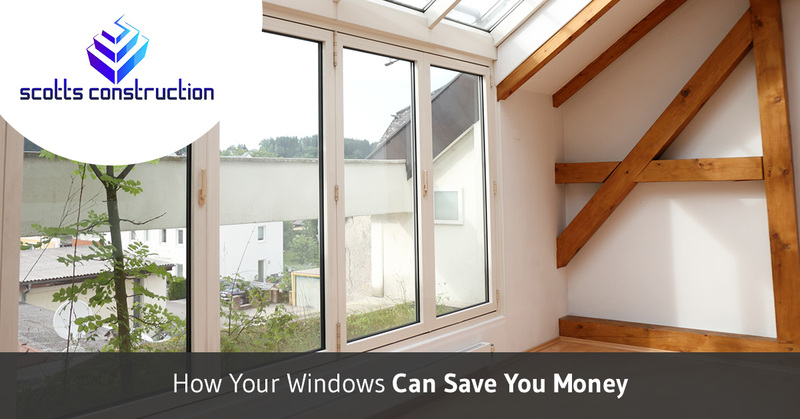 Here are some insights into the world of windows and how to ensure that they’re helping you out instead of draining your budget. Windows need to be inspected. Windows will show you if they’re doing well or not. At Scotts Construction, we have several signs we look for when trying to determine if a window needs to retire or not. If we see majorly faded areas on your floors, it means you need different glass that can block out the sun’s UV rays. For instance, if we spot condensation between the panes of glass on a double- or triple-glazed window, chances are good a seal has failed and you may need a new window. We also assess the glass package you have to determine whether or not you have the right system for your area. Believe it or not, the insulating abilities of windows can be fine-tuned to help your home save energy in your unique environment. How do you know your windows need to be replaced? Windows stand up to moisture, dirt, and sun on a daily basis, and even though they’re tough, they aren’t invincible. As they age, they become less and less efficient and can drag your house down as a whole. In general, windows should be replaced around every 20 years. This isn’t just because they wear down, but also because window technology improves with time and it’s a bad idea to miss out on the advantages it can bring you. Saving money on energy bills is one of the biggest benefits; in fact, great windows will pay for themselves over time in energy savings. At Scotts Construction, we have a lot of experience with windows of many different ages and types, and part of what we love about our job is setting up our clients to save money on energy bills in the future. As Orland Park’s premier contractor, we know how to ensure that windows will be able to perform at their best for you for years to come. Contact us today and we’ll make sure that your home is ready to keep you warm and save you money this winter!